Yesterday, I wrote about an unusual way to use the Foley urinary catheter to plug a heart wound. This allows you to buy time to get to the operating room to perform the definitive repair. But this cheap and effective tool is very versatile, and can be used in other body areas as well. Consider a deep penetrating injury to the liver. It takes time to determine which method for slowing/stopping the bleeding is most appropriate. Sure, the doctor books say to occlude the inflow by gently clamping the hepatoduodenal ligament (Pringle maneuver). But this takes time, and can be difficult if there is lots of bleeding. You may be able to gain some time by placing a properly sized Foley catheter directly into the wound and carefully inflating with saline. You must inflate the balloon to feel, not to its full volume. It should be snug, but not so full that it cracks the liver parenchyma and causes yet more bleeding. Bottom line: Any time you find yourself facing bleeding from hard to expose places, think about using a balloon catheter like the Foley. Sizing is critical, and the balloon volume is more important than the catheter diameter. Estimate the size of the area that needs to be occluded, and then ask for a catheter with a 10cc or 30cc balloon. If you need smaller, more precise control, try a Fogarty arterial embolectomy catheter instead. As with the cardiac Foley, be sure to occlude the end so you don’t create a conduit for the blood to escape. If your patient does well, and you need to leave the catheter in place for a damage control closure, LEAVE THE CATHETER COMPLETELY WITHIN THE ABDOMEN. If you exteriorize the end, some well-meaning person may unclamp it, drop the balloon, or decide that it can be used for tube feedings. 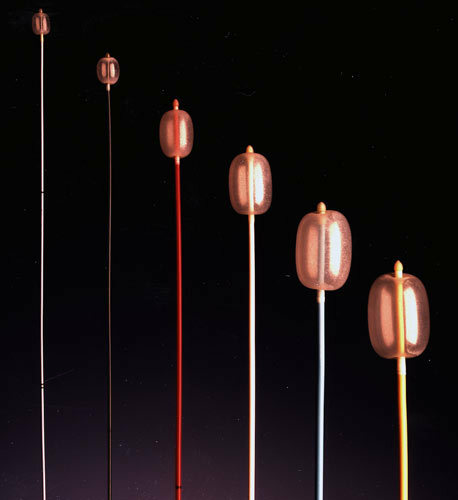 TIP: If the distance between the balloon and the catheter tip is too long, DO NOT TRY TO SHORTEN THE TIP BY CUTTING IT! This will damage the balloon and it will not inflate. Over the years I’ve seen a number of trauma professionals, both surgeons and emergency physicians, order liver transaminases (SGOT, SGPT) and bilirubin in patients with liver laceration. I’ve never been clear on why, so I decided to check it out. As it turns out, this is another one of those “old habits die hard” phenomena. Liver lacerations, by definition, are disruptions of the liver parenchyma. 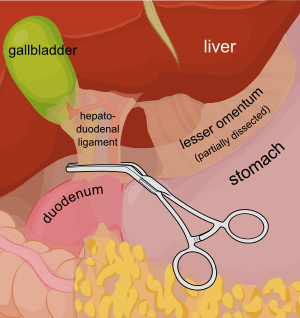 Liver tissue and bile ducts of various size are both injured. 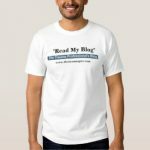 Is it reasonable to expect that liver function tests would be elevated? A review of the literature follows the typical pattern. Old studies with very few patients. From personal hands-on observations, the liver tissue itself tears easily, but the ducts are a lot tougher. It is fairly common to see small, intact ducts bridging small tears in the substance of the liver. However, larger injuries can certainly disrupt major ducts, leading to major problems. But I’ve never seen obstructive problems develop from this injury. A number of papers (very small, retrospective series) have shown that transaminases can rise with liver laceration. However, they do not rise reliably enough to be a good predictor of either having an injury, or the degree of injury. Similarly, bilirubin can be elevated, but usually not as a direct result of the injury. The most common causes are breakdown of transfused or extravasated blood, or from critical care issues like sepsis, infection, and shock. Bottom line: Don’t bother to get liver function tests in patients with known or suspected injury. Only a CT scan can help you find and/or grade the injury. And never blame an elevated bilirubin on the injury. Start searching for other causes, because they will end up being much more clinically significant. Evaluation of liver function tests in screening for intra-abdominal injuries. Ann Emerg Med 20(8):838-841, 1991. Markers for occult liver injury in cases of physical abuse in children. Pediatrics 89(2):274-278. Combination of white blood cell count with liver enzymes in the diagnosis of blunt liver laceration. Am J Emerg Med 28(9):1024-1029, 2010. 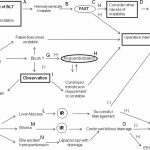 Yesterday, I posted the Western Trauma Association’s algorithm for operative management of blunt liver trauma. Click here to view it. Today, I’m going to discuss their algorithm for nonoperative management. The algorithm is fairly self-explanatory. Click on the image above to read the annotated text for details on each step. Note: this requires full access to the Journal of Trauma. Unstable patients need rapid identification of the cause. If the FAST is positive ©, then you need to go to the OR and use the operative algorithm. CT scan is used for diagnosis in stable patients (F), but if a liver injury is seen and they become unstable at any time, go to the OR. Contrast extravasation in a stable patient should prompt an evaluation and possible embolization by interventional radiography (G). If complications develop (SIRS, abdominal pain, fever, jaundice), a repeat CT is indicated (K). Abscesses and focal collections of bile may be managed by interventional radiology (L,M). 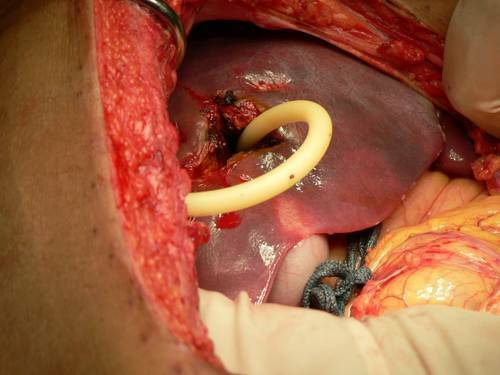 Persistent bile leak may be decreased by ERCP and sphincterotomy (O). Bile ascites or large hemoperitoneum may be managed using laparoscopy with drainage (N). Reference: Western Trauma Association critical decisions in trauma: nonoperative management of adult blunt hepatic trauma. J Trauma. 67:1144–1148, 2009. 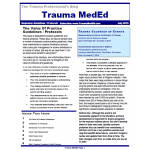 The Western Trauma Association has just published guidelines on decision-making when faced with hepatic injury in the OR. The algorithm is based on the available literature, which contains little prospective, randomized trial data. 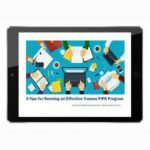 Nonetheless, it is a valuable tool that can be used to develop your own institution-specific protocol. Simple hemostatic maneuvers are usually successful with minor bleeding (A). Sequential use of more involved maneuvers is indicated for major bleeding. In order, they are packing (B), Pringle maneuver (D), selective vessel ligation within the liver (E), and finally selective hepatic artery ligation (F). Damage control laparotomy and interventional radiology are useful adjuncts. Tomorrow I’ll write about the nonoperative blunt hepatic trauma algorithm. Click here to view it. 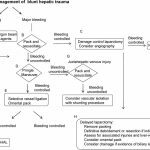 Reference: Western Trauma Association/Critical Decisions in Trauma: operative management of adult blunt hepatic trauma. J Trauma 71(1):1-5, 2011.